If you’re sick of hauling heavy hoses around or you’ve just had one kink or twist on you too many times, an expandable hose will change the way you do your lawn work. We researched a range of styles and sizes and put together this expandable hose buying guide to help you find the right one for you. Before we get started, let’s take a close look at some of the key features you need to know about before you shop. Unexpanded Length: Unexpanded length varies from hose to hose but the determining factor is how long the hose is when it’s expanded. With few exceptions, the unexpanded length is usually ⅓ of the expanded length. Expanded Length: You can get this kind of hose in various lengths, including 50, 75, and 100 feet like the ones that we reviewed. Some are available in longer lengths but the lengths we picked are usually enough for home use. 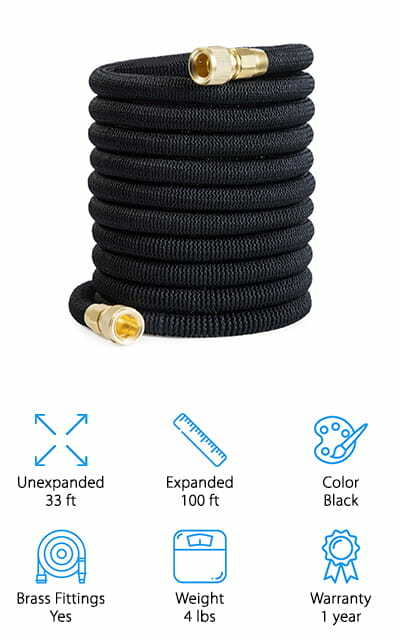 Color: Black is the standard color for expandable hoses. That said, if you’re looking for something brighter and more colorful, you’ll find some great options in green and blue, too. Color doesn’t make the hose better, but it might make you like it more. Brass Fittings: Brass fittings are important. Not only don’t the rust or oxidize, they’re also tough, last a long time, and don’t leak. If you want a hose that can go the distance, you have to get one with brass fittings. Weight: We were actually surprised by how lightweight these hoses were, though some are much lighter than others. Weights on our top picks range from 1 to 4.5 pounds. A bit of a range but, like we said, all lightweight. Warranty: As always, warranties are important. Make sure you know what is and isn’t covered under your warranty. For example, you aren’t supposed to let these hoses bake in the sun so damage resulting from that might not be covered. Now that we know a little bit more about these features, let’s move right into the products to figure out what is the best expandable hose. Here’s the deal: our top and budget picks are right at the top of our list. That’s the best place to start if you don’t have a lot of time because you can get some idea of the range that’s available. Stick around if you can, though. These products are all pretty awesome. Alright, let’s get to it. 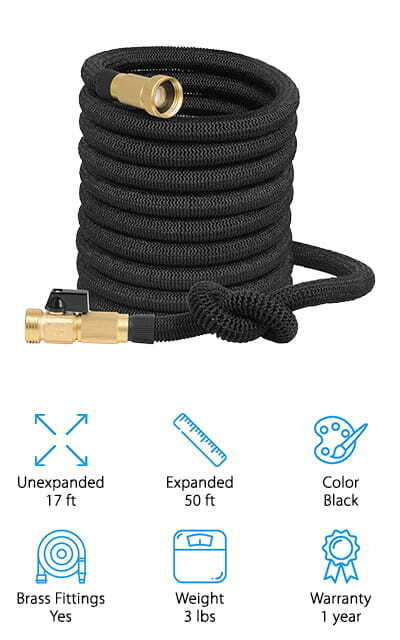 The Hospaip Expandable Water Hose is a top rated expandable hose that is incredibly durable. What makes us say that? It comes with ¾ inch brass connectors, a rubber washer double latex pipe, and a super flexible polyester fabric cover. One of the best things about it is the nozzle. First of all, the zinc alloy construction and rubberized outer coating are comfortable to hold and slip-resistant making it easy to get the stream right where you need it. And get this, it lets you choose between 8 different spray patterns. Whether you’re washing your car, bathing your dog, or watering the garden, all you have to do it turn the control knob to the pattern you need. It even comes with an easy to use storage bag, too. 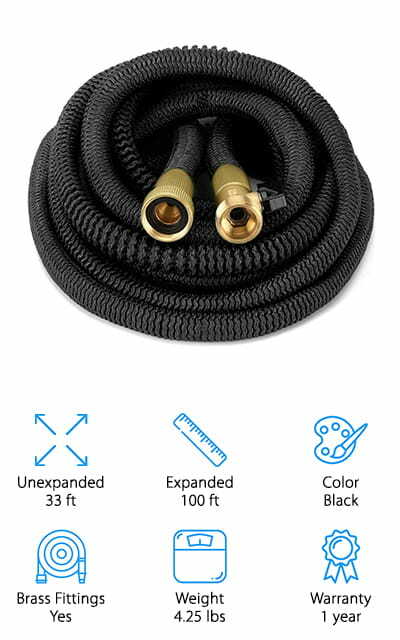 If you’re looking for the best cheap expandable hose, look no further than our budget pick: Joeys Garden Expandable Hose. This might be an inexpensive option but that doesn’t mean it’s not high quality. Everything from the brass connectors to the nozzle and sprayer is made with tough, long-lasting materials. This hose won’t rust, leak tear, rip, or crack. It’s really lightweight, too, so it’s easy to pull it around while you’re doing your yard work. The 8-way spray nozzle is perfect for watering your lawn, garden, or flower beds and can be adjusted to a more focused spray when it’s time to wash your car. That’s not all, it also comes with comes bonus accessories. The hose hanger and storage sack provide convenient ways to keep your hose tucked away when not in use. 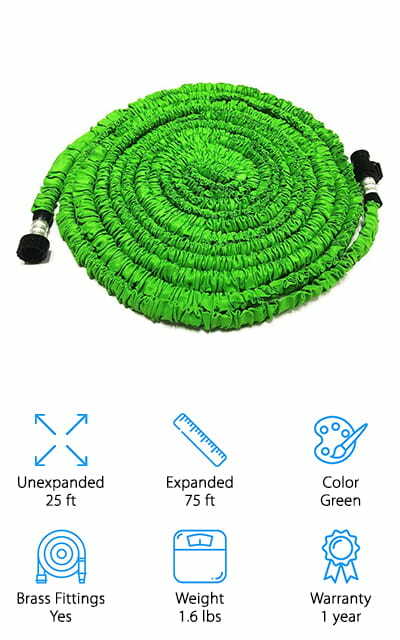 The next product we came across in our research for the best expandable hose is the GrowGreen Garden Hose. One of the cool things about it is that it’s the only expanding hose that can get to its full length with standard water pressure. That’s because it’s made out of pressure-resistant latex and won’t burst, leak, or break. The connectors are practically indestructible and the solid brass fittings are high quality, too. 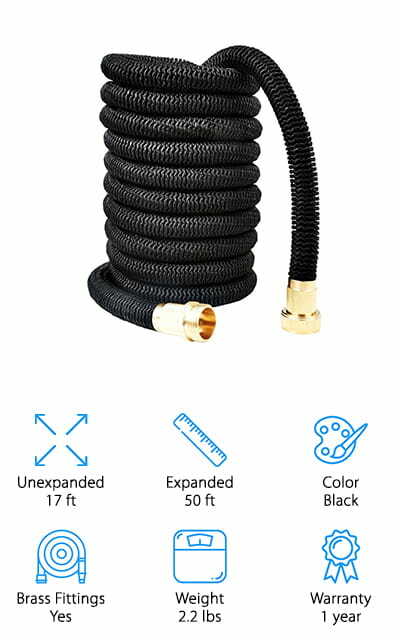 This is a really flexible hose that will never tangle, twist, or kink. It’s also really lightweight, especially when you consider the 100-foot length. It also comes with a storage sack. While all of these hoses are durable, it’s not good to leave them sitting out in the hot summer sun. A storage bag is the perfect solution. GLOUE Magic Hose is up next in our expandable hose reviews. This is a lightweight hose that’s really flexible and won’t kink. That’s always important when it comes to a hose but when you’re working with on that’s 100 feet long, it’s really important. It’s a really durable hose, too. The core is made of a double layer of latex while the outer layer of high-strength polyester gives it added protection. That’s not all, the connectors are made of 100% brass and were made to last a long time. This hose includes spigot and nozzle adaptors as well as a storage bag to keep it protected when not in use. And get this, if you need a longer length, there’s even an adapter available so you can connect 2 together. Our next option for best rated expandable hose is the Adoric Life Expandable Hose. The liner is strong and won’t explode, leak, crack, or corrode under pressure. 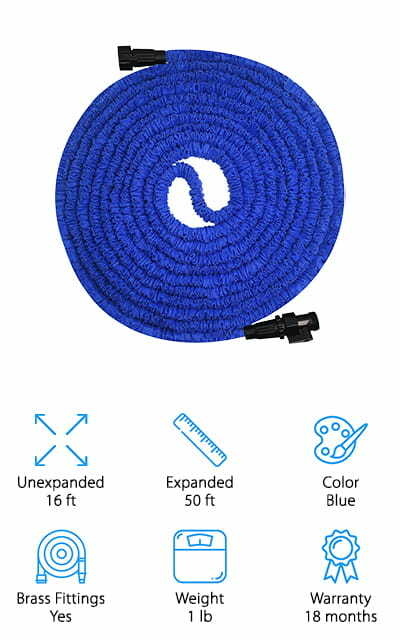 It’s covered by a high strength polyester knitted casing which not only protects the inner pipe but also keeps the hose untwisted and kink-free. The connections are all made of solid brass that won’t leak, rust, or corrode. The sprayer has a non-slip surface and a comfortable grip so you can move around your yard and water everything you need to. And get this, there a 9 different spray patterns. 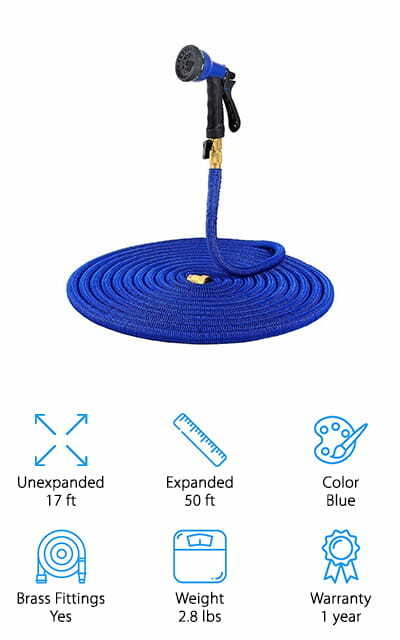 You can use this hose to do just about anything and, to help you get started, they include a lot of helpful accessories. You get a chenille car wash glove, hanging hook, extra sealing rings, and a storage bag. 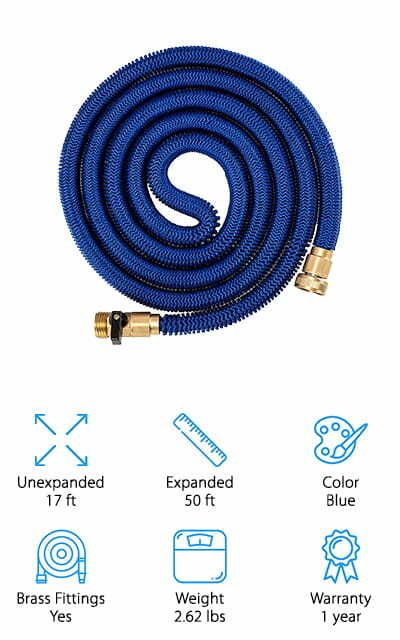 When it comes to the best expandable garden hose, you can’t beat the GenLed Garden Hose. 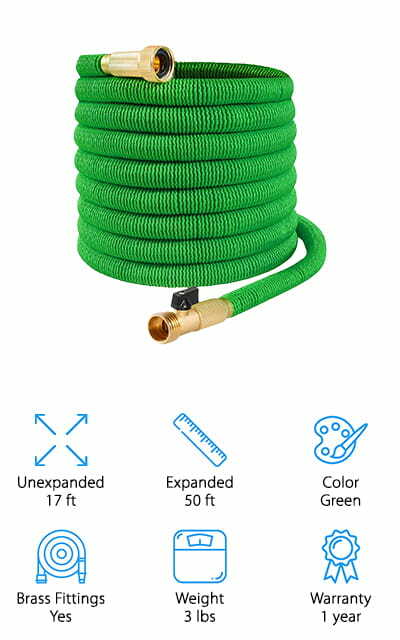 If you’ve found that a 100 feet long hose is a little too long, give this 75 feet one a try. It won’t tangle, twist, or kink. It’s also really flexible. It’s really easy to handle with it’s in use but the flexibility is also really useful when it’s time to put it away because it’s so easy to roll up. This is one of the lightest ropes that we reviewed at only 1.6 pounds. The double layer latex core is covered with a tightly woven fabric that adds an extra layer of protection. Plus, the brass fittings won’t break, crack, leak, or corrode. In addition to the warranty, there’s also a 45 day money back guarantee. The KLAREN Garden Hose is the best expandable water hose if you’re looking for something that’s going to last a long time. In fact, they claim it lasts longer than 40% of other hoses. What makes it so tough? For one thing, the inside is made of 3-layers natural latex that’s covered with high-strength polyester. It won’t kink, twist, or tangle, either. A durable brass connector is also included that prevents leaks and damages. There’s more, you also get an awesome spray nozzle that has 8 different pattern settings: shower, mist, center, flat, cone, soaker, full, and angle. These options make this hose really versatile. You can use it for tough jobs like washing your car or delicate jobs like misting freshly planted flowers. It also comes with a longer warranty than most of its competitors. The Kevri Expanding Hose is definitely in the running for best expandable hose on the market. When compared to other 50 feet hoses, this one is really lightweight. It’s also flexible, really easy to handle, and won’t tangle or kink. The brand also claims that their hose will last 35% longer than other hoses like it which has a lot to do with the fact that the use the best materials available, is really strict about quality, plus they use modern production processes. Inside, it has a 2 layer core that’s 2mm thick. The outside has a high strength polyester woven cover that self-retracts and protects the inner core. 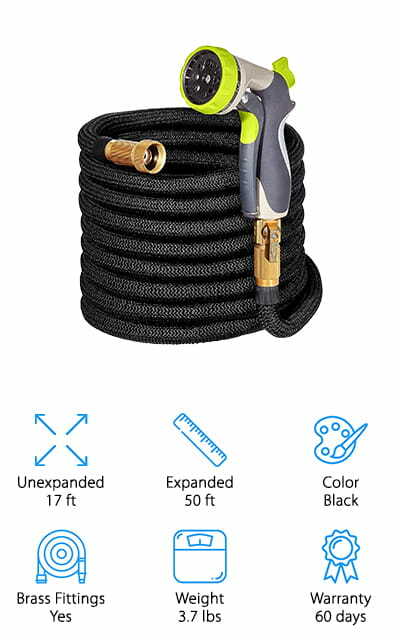 If you’re looking for a hose that’s great for lighter jobs like watering plants or your garden, this is a great choice. The Ohuhu Expandable Hose is about great choice for best expandable hose for sale. It has a unique snake-shaped design that helps decrease wear and tear between the 2 layers. How does it work? It decreases the friction between the inner latex layer and the outer polyester layer which helps extend the lifespan. That’s not all, this hose doesn’t twist, kink, or tangle plus it’s super flexible and easy to handle. The solid brass rings really durable and prevents leaking in a way that plastic fittings just can’t provide. That’s not all, to make this hose more versatile, they also include a nozzle sprayer with 8 adjustable patterns so you can use this for just about any job. It has an easy to use design and a comfortable grip, too. The Crenova Expandable Hose is the last pick in our best expandable hose review. One of the best things about this hose is that it has a thicker knit wall covering that’s actually seamless. That means it’s really good at protecting the inside tube and help prevent any bursting or leaks under high water pressure. It also never kinks or twists and is pretty durable in tough weather conditions. It’s able to tolerate temperatures of 23 to 122 degrees Fahrenheit so you can actually use it all summer and into late fall or early winter before it gets too cold. For proper storage, this hose includes a hanger and a storage bag to make sure you have a way to store it properly. One more thing, there are also solid brass connectors and removable hose fittings.